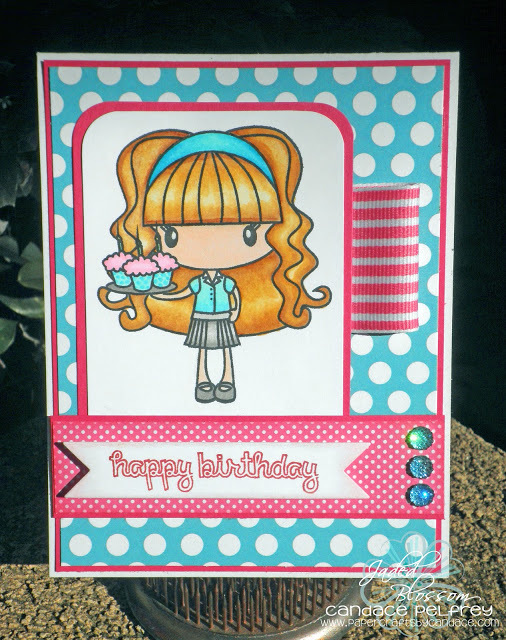 Paper Crafts by Candace: Jaded Blossom BIRTHDAY blog hop! Super cute projects Candace! Love the star candies - really cute! All of your projects are just darling! My favorite has to be that card...I just keep going back for one more look - she is so stinkin' cute! 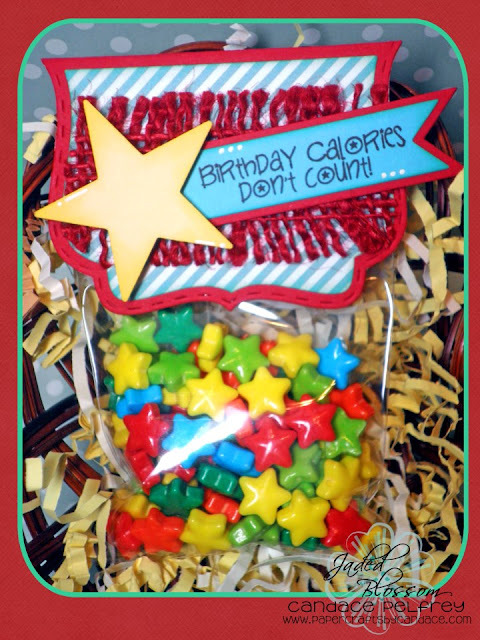 I'm loving those cute little star shaped candies, I'll have to look for those. This is super cute!! Happy Birthday you guys are aweosme! Very cute Candace..I am going to have to go to Target now and get that candy...How cute are those stars???? LOVE! Very cute! So wish we had target here! Happy birthday! Very, very, very cute!! Happy 1st Birthday Jaded Blossom! Super cute!!! Love the star candy! Happy 1st Birthday to Jaded Blossom! awesome projects candace i especially like the stamped cotton bag. Happy Birthday Jaded Blossom! Love the card and star candy bag! Love the projects and happy Birthday Jaded Blossom! Happy Birthday, Jaded Blossom. And i love your projects, Candace. Great job! Great job Candace! I love the little girl in the stamp set...I'm going to have to learn to use copies!! Loved all of your projects Candace! Fabulous as always!! (: Congrats on JB's success!! Great projects as always!! Happy Birthday Jaded . 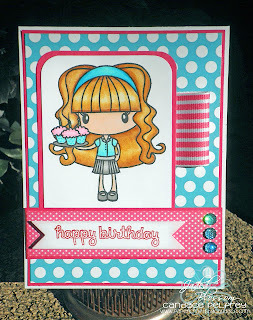 The birthday calories don't count is such a cute stamp I love how you used it with this ribbon! Great projects! Lots of ideas. I always get great ideas on your blog! So creative you ladies are!! Happy 1 year!! Such cute projects. Great use of the stamps. I love your projects. Great Job. EEEeeccckkk! My favorite release yet!! (again!) 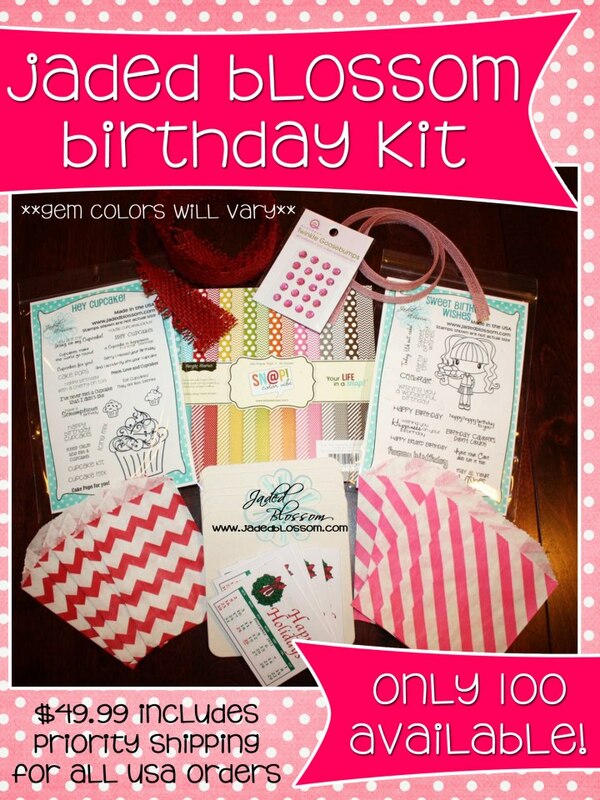 I just love this birthday kit and these stamps are sooooooo FUN!!! All your projects were adorable and perfect!!! Happy Birthday Jaded Blossom!!! Happy birthday to Jaded Blossom! I'm so happy for you guys! 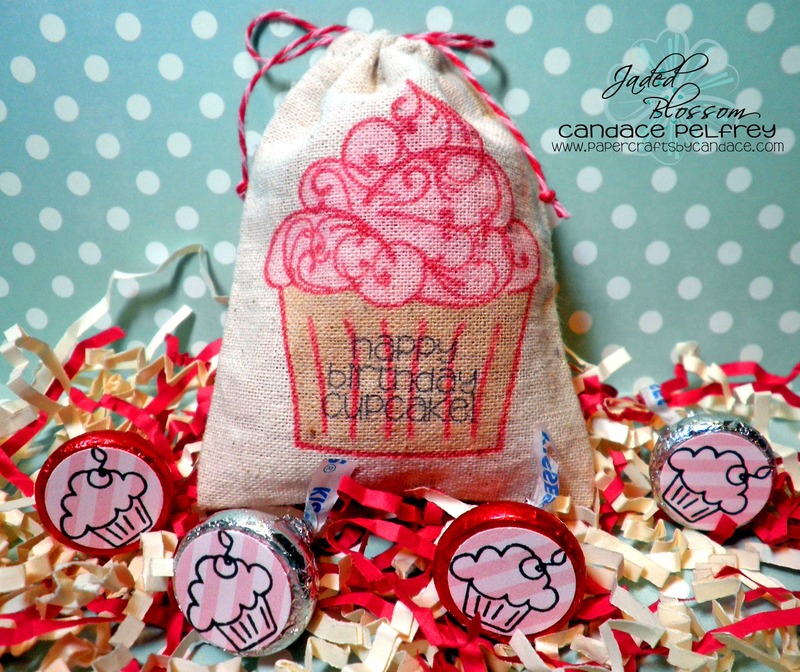 Your cupcake treat bag is just the cutest! A definite must have set for me. Thanks for the chance to win! Love the little bag of star candies. The sentiment is soooo cute. Super cute! Love the star candies ;) Happy Birthday to Jaded Blossom! 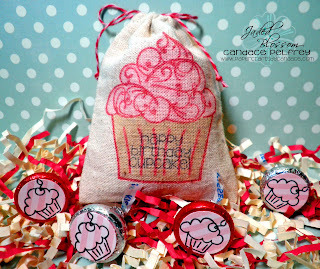 Love that burlap bag you stamped! And as usual, all of your projects are awesome! Happy Birthday Jaded Blossom!!! LOVE all your awesome projects!!!! Thanks for sharing all this creativity! Loved all of your projects. Love the hop treat. The star candies are really cool and I love the burlap.